Coming into the home stretch for this month of kids’ superhero movies is what is likely to be the youngest skewing movie I will ever cover on this site, unless I run out of other movies to review. I’m not interested in reviewing something intended for preschoolers like Dora the Explorer: Superbabies, but even this is probably stretching what passes for an actual movie. For one thing, it only runs for about 48 minutes: the length of an hour TV show minus commercials. The target audience is also for around 5-10 year olds, but that’s not too far from the target audience for other superhero shows like Superfriends. And also, it’s part of the dreaded Christian propaganda machine. Not that I have anything against Christians in general, I still vaguely consider myself to be one, but their idea of entertainment usually falls more on the side of being preachy than being entertaining. 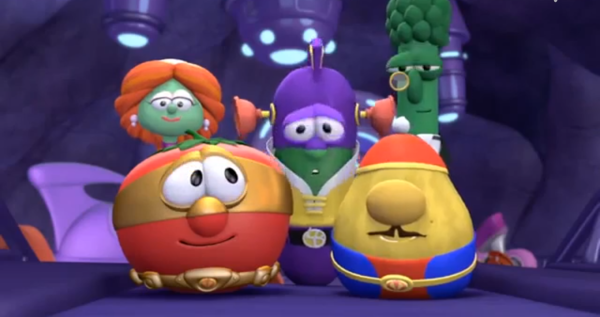 But I have had my experiences with Veggietales as both an uncle and a father so I more or less knew what I was getting into, and I have to admit that I do enjoy the sense of humor that goes into these films. It’s just that message crammed into the end that sours it a little for me. 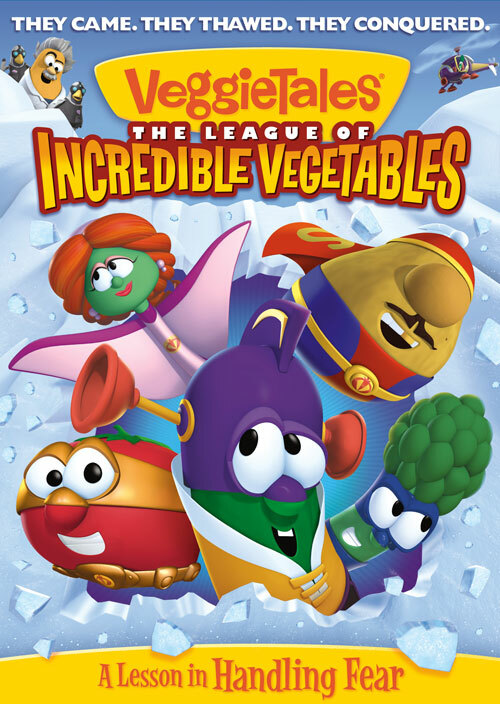 Going into this movie, it helps a bit to have a background with Veggietales as a whole, there’s very little set up and it just goes straight into the typical format where the more simple minded cucumber Larry and straight man tomato Bob get an advice-seeking letter read to them by the very Butler-esque asparagus Alfred. There’s a joke about changing in a phone booth, then it goes into the story proper. At about the halfway point, there’s a break for a Silly Songs With Larry-Boy, which is Larry’s superhero name, and the end wraps up back with just Bob and Larry. Even the format does feel much more fitting of a TV show than it does for a movie as you can really feel where the commercial breaks would fit in. 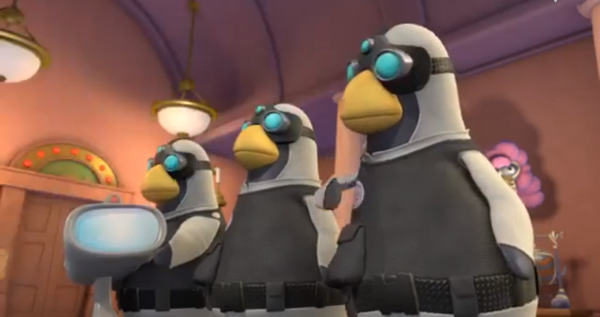 The penguin henchmen who for some reason don’t talk in a world of talking vegetables. Of course, since this is both a semi-educational program for kids as well as a Christian sponsored program there is the overlying message that the story is centered around. The lesson itself is based around fear and how to handle it which makes perfect sense to center it around a superhero theme where the heroes may be afraid of the villains, but it doesn’t exactly come across that way in the story. Instead, the heroes aren’t specifically afraid of the villain, but instead he uses this device called the Fear-dar that scans them so he knows what specifically they are most afraid of which is then mainly used for a visual gag. For example, Larry-boy’s biggest fear is the sound of popping balloons, and Thingamabob’s fear is monkeys. But the solution that they come up with at the end for Junior Asparagus, the newly appointed member of the League of Incredible Vegetables is to have faith in God and then he won’t be afraid of anything any more. Simply put, that’s essentially the worst advice to give someone, Christian or not. And there isn’t any hint of any other solution that’s more practical. Not only that, but if you weren’t aware of the Christian nature of the movie then it comes out of nowhere right at the end. What does save this movie from being an adult atheist’s nightmare is the humor. There are several fun and quirky gags throughout the film that anyone could find funny. Yes, there are plenty of jokes that are more specifically aimed at a younger crowd, but if you get a kick out of a good pun-based joke then you’ll find something that will make you laugh. It’s also interesting to see the overall style of the animation. It’s fairly surprising how much range of motion and suspension of disbelief the animators are able to bring to these vegetable characters who don’t have any limbs, but are able to interact with their world as if they do and it’s done convincingly. The world of Veggietales does have some real oddities though, especially during the silly song segment where they are sitting down at a table to eat their dinner which consists of plenty of vegetables. How do they explain how they are vegetables and are eating other vegetables, isn’t that a weird form of cannibalism even if they aren’t specifically eating any veggies represented by any of the characters sitting at the table. But as far as Christian programming in general goes, this is likely to be one of the high points. If you are a religious person yourself and have kids of your own, this is one of the best choices out there as something that you can watch with them and not want to gouge your eyes out. Until next time, this has been Bubbawheat for Flights, Tights, and Movie Nights. Posted on April 23, 2016, in 10's movies and tagged animation, Christianity, film, kids, movies, review. Bookmark the permalink. Leave a comment.